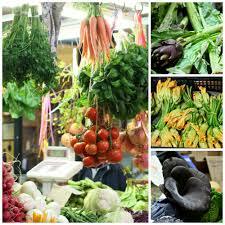 Municipal food markets: why Cagliari but not Wood Green? 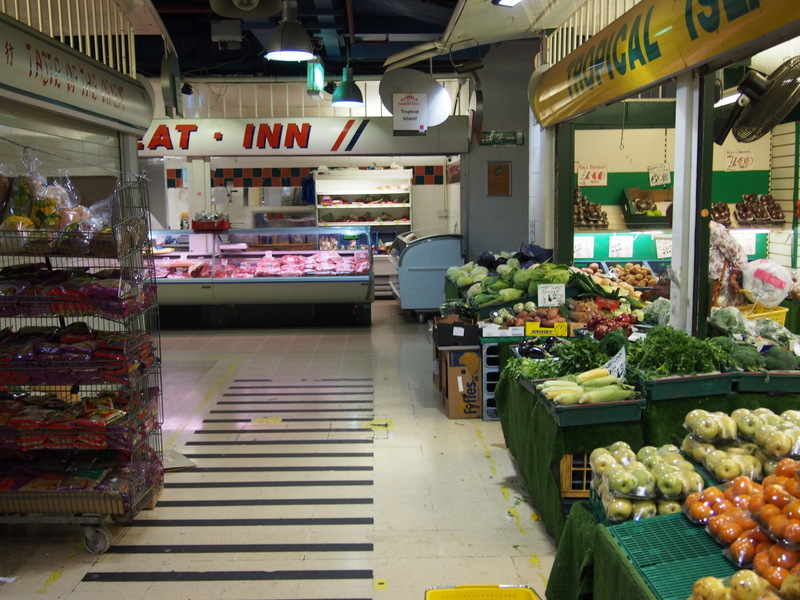 I’ll begin with my conclusion: municipal markets – daily indoor markets with a core of stalls selling fresh produce, meat and baked goods – should be at the centre of “regeneration” plans for town centres. In April this year I was in Cagliari, Sardinia, working (life in the academy is tough, I tell you). 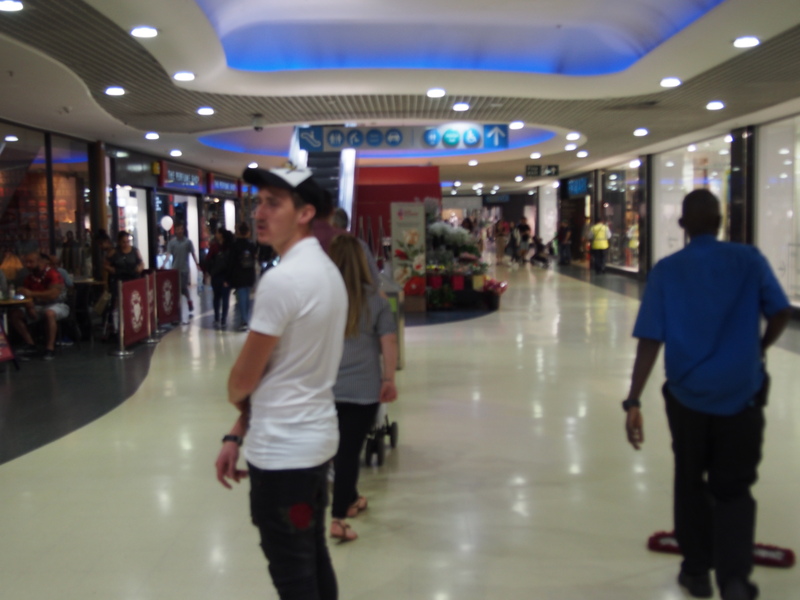 I was fortunate to be staying near the San Benedetto market. At 8,000 square meters it is the largest of Cagliari’s four municipal markets; the city’s tourist information claims it’s the largest municipal market in Europe. It’s on the tourist map because people like it – go on a day when there’s a cruise ship in port and you’ll know that a lot of the people are not from around here. But the customers are mostly local, because most of what is sold in the market is perishable and most of that needs to be cooked or eaten soon: fish, meat, vegetables, fruit, cheese, baked goods, that’s most of it. There are many competing greengrocers, butchers, bakers, cheese sellers – and many, many fishmongers – all in one space. And it’s almost all fresh food: look for a roll of paper towels or a can of sweet corn and you’ll be directed to “the discount” – a smallish chain supermarket across the road. Cagliari has about 150,000 residents – less than a London borough. Returning to my neighbourhood in London, I contemplate the fresh food options. First, is there anything remotely resembling that market in Cagliari? A mile from home, in Wood Green’s salubrious Shopping City, hidden far from view, I do find a market. You could be forgiven for not knowing it was there, because as you enter the mall with its Primark and other chain stores, the sign for the Market Hall is … discrete. 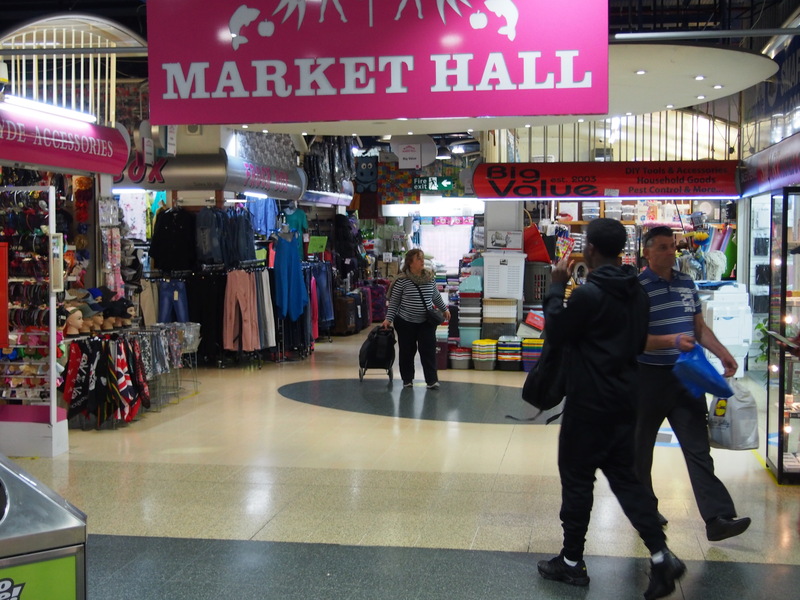 Finding the market hall in Wood Green is like finding the toilet, or wheelchair access: if you already know you need it, clues to its location can be found. Once you find the market hall, what greets you is not fresh produce or the smell of roasting coffee but cut-price kitchenware and luggage. There are some bargains to be found here and at its best the non-food part of the market hall might even remind you of a souk, but there’s nothing in it that hints it might be where I want to go for my weekly grocery shopping. After a couple of twists and turns through the luggage, carpets, keys-cut-and-shoes-repaired, news agent, mobile phone accessories and electricals, we do find the food: one greengrocer, two butchers, and one fishmonger; one each of stalls selling (mostly non-perishable) Caribbean, East Asian and Eastern Mediterranean foods; and a few places to sit down and eat. Why is this market hidden? Why has it been kept so small, with almost no competition between traders? You might say there’s not much appetite for fresh food markets in Britain … “Sardinia, Mediterranean, they can pick fresh vegetables year ‘round and they cook their famous healthy foods at home. Here in London we buy ready-made food to microwave. If we do want fresh food to cook, we’ll save time by picking it up at the supermarket.” There’s some truth to that. Yet the distinctiveness of Mediterranean eating habits is, it turns out, sadly exaggerated. And if you look from one city in Italy or Spain to another, you’ll find that some have excellent public markets and others have rather dreary, second-rate ones: quality public markets require good management. What’s more, if I look about London, I see people going to a great deal of trouble both to provide and to purchase fresh groceries in places other than the superstore chains. There are street markets, scattered street stalls, and farmers markets. Getting groceries to you in this way requires the stall holders to set up and break down their shop every day, and to deal with perishables without any on-site refrigeration. It is exactly this costly process that indoor daily markets, like that in Cagliari, replaced. There are neighbourhoods, including Harringay Green Lanes where I live, in which numerous grocers sell from shops lined up in a parade, shops too big to be market stalls and too small to be supermarkets. Typically these shops are small, but generalist: fruit and veg; a meat counter; off license; dairy and dry goods from the usual vendors, with a particular focus on the foods of the immigrant community from which the grocers hail (in the case of Green Lanes that means Cyprus and Turkey). If these same merchants were doing business in market stalls they would focus on doing one thing well; on a typical high street, the minimum space available is one shop, and this seems to give us a lot of small-but-not-specialist grocers. Finally, you can get boxes of fresh local vegetables delivered to your door, if you don’t need to choose what you’re going to cook. Most of us do use major supermarkets for much of our food shopping, and yet these alternative sources of fresh foods – street markets, lone street stalls, farmers’ markets, clusters of shops all selling similar general lines, and veg boxes – persist and even grow. That they do so reflects both a hunger by many consumers for fresh food from small vendors, and the will of small vendors to meet that need. The meeting of consumer and small vendor takes place mostly through these clumsy and costly arrangements – street- or farmers’ market stalls that have to be set up, broken down & transported daily; high street shops that are too big for their function; fresh veg purchased through the seasonal lucky dip system of the veg box, sight unseen – because we don’t have adequate space in well run public markets. But why don’t we? A space for market stalls seems a simple thing to provide. There are, I think, two big reasons. One is that public markets don’t bring big profit opportunities for developers, so that when redevelopment occurs markets get squeezed. The other is that public markets are not as simple to manage as they look: while the vitality of a market depends on the distinctive contributions of the different traders, the choices of individual vendors do not automatically add up to a successful market. I’ll come back to this point in a later post; for now, the take-home is just that the reason some cities have excellent public food markets and others do not, is due mainly to differences in management. This entry was posted in Cities and tagged municipal markets by Frederick Guy. Bookmark the permalink.